Hiking activities for seniors is one way to help keep seniors physically active, fit, and engaging in various adventures. Advancement in age and development of physical limitations are not actually barriers for seniors to enjoy hiking activities, just like many people believe. 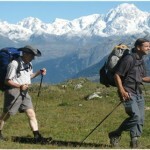 Just as long as seniors who are engaging in hiking activities know their capabilities and follow hiking trails according to their present physical condition, then they will surely gain hiking activities’ benefits. It has been proven that seniors who engage in various physical activities, such as hiking, are happier and healthier than those seniors who do not engage in any physical activities. 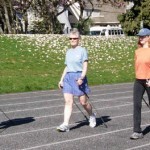 Seniors who are going to engage in hiking activities can really benefit from using walking poles. 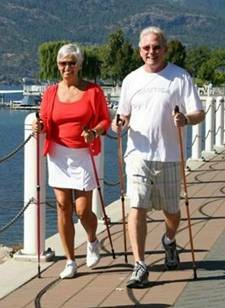 Walking poles can provide extra stability to anyone, not just seniors, who are going to use it as they walk. Since seniors have a decrease balance capabilities and they are more prone to falls, using walking poles can really be beneficial at it can provide extra balance points that can prevent seniors from falling down. 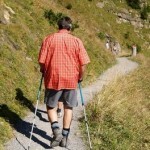 To make it short, walking poles used by seniors in hiking can add steadiness to anyone’s gait or balance. As people grow older, it is included in the normal aging process the degeneration of the joints. Seniors who go on hikes and use walking poles can help in relieving pressure from their knees, back, and ankles. Walking poles used on hiking can help in distributing the impact of each stride to 4 contact points, the senior’s both feet and 2 tips of each walking pole (right and left). 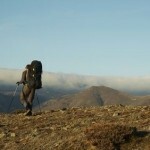 Using walking poles can help in preventing back pain and other joint pains after a prolonged or strenuous hiking activity. Even if walking is one of the most common activity a person does every single day of his life, most people still have very bad postures. Proper posture during walking can help in preventing back pain and it can also improve a person’s gait or balance. It is very important for seniors to have a proper posture, since they are at higher risks for osteoporosis and other bone injuries. 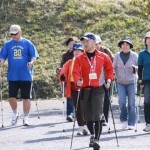 Walking poles can’t provide automatic correction of improper postures, but it can help a person or encourage a person to straighten his or her back while walking. Walking poles can help in maintaining proper alignment of the spinal column, which is very beneficial to everyone, not just to seniors.